In the US, they call it leaf peeping, in Japan, momijigari. It's when people flock to parts of the country to see leaves change colour in autumn. Think of leaves as being like little solar panels for trees. Just as solar cells use light to produce electric energy, leaves use light from the sun to produce food for trees. This process is known as photosynthesis, which means “to put together with light.” When light enters the leaf, a special part called a chloroplast (klo-ro-plast), uses the light to change carbon dioxide and water into breathable oxygen and a sugar called glucose. Inside the chloroplast is a chemical called chlorophyll. Chlorophyll is very important, because it is the chemical that allows photosynthesis to take place, and it gives leaves their green color. When autumn comes and winter is on its way, you’ll notice that it doesn’t stay light outside nearly as long as it did during the summer. That means that the leaves don’t get as much light as they used to, and the amount of chlorophyll starts to decrease. Remember, chlorophyll is what gives a leaf its green color, so as there is less chlorophyll, the leaves loose their strong green color. There are always small amounts of other certain colors in every leaf, so when the green starts to fade, the other colors start to become visible. 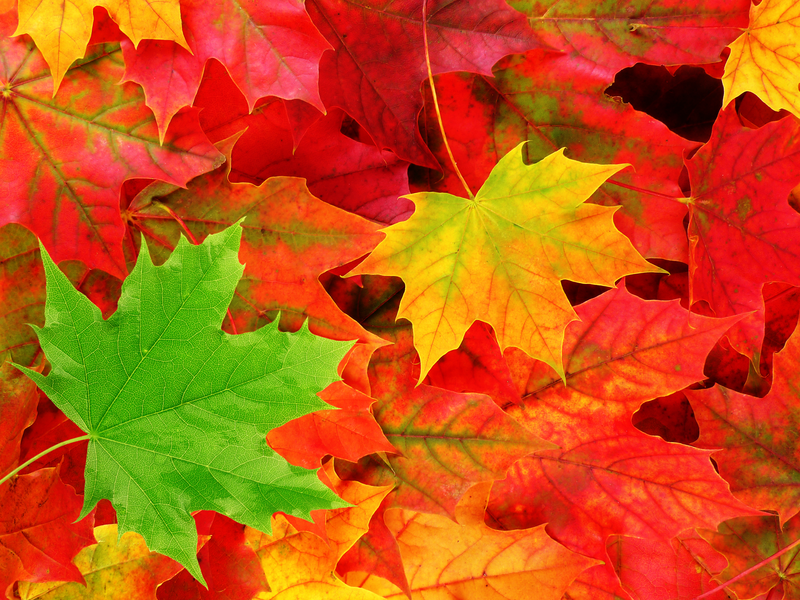 Some of the colors that might hide in leaves until fall are browns, yellows, and oranges (the color, not the fruit!). Colors like reds and purples are made by chemical reactions inside the leaf. Brown: The leaf is dying or already dead. Yellow and Orange - These colors are made by chemicals called carotenoids (keh-rot’n-oids’). These are always present in small amounts, but they become more visible when the green color starts to fade. Red and Purple - These colors are made by chemicals called anthocyanins (an-tho-SI’ah-ninz). These are formed by chemical reactions that usually take place as the weather starts to change in the fall. Leftover food (glucose) in a leaf can also make a leaf look red. All of these colors can combine to form even more colors. That is why you might see so many different colors on the trees in your yard, or even on a single tree.